This 4-year efficacy trial tested whether a home-based, self-administered parenting program could have a long-term effect on children’s cognitive susceptibility to alcohol use, and it tested hypothesized moderators and mediators of any such program effect. Using a two-group randomized controlled design, 1076 children (540 treatment; 536 control; mean age of 9.2 years at baseline) completed telephone interviews prior to randomization and follow-up interviews 12, 24, 36, and 48 months post-baseline. Mothers of children randomized to treatment received a 5-month-long parenting program during year 1, followed by two 1-month-long boosters in years 2 and 3. 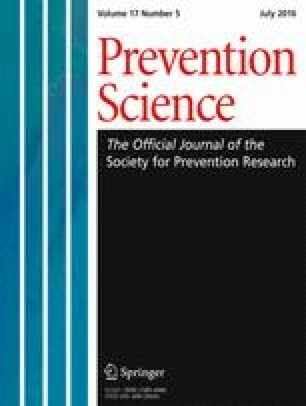 Exposure to the program was significantly inversely associated with susceptibility to alcohol use 48 months post-baseline (b = −0.03, p = .04), with no variation in program effects by parental alcohol use or mother’s race/ethnicity or education, suggesting broad public health relevance of the parenting program. Path analyses of simple indirect effects through each hypothesized mediator showed that program exposure positively influenced parental communication to counter pro-drinking influences in the family and media domains and parental rule setting 36 months post-baseline; these variables, in turn, predicted reduced susceptibility to alcohol use 48 months post-baseline. Parallel (multiple) mediation analysis showed that the program had a significant indirect effect on susceptibility through parental rule setting. Together, the findings indicate that internalization of protective alcohol-related expectancies and intentions is possible among children whose mothers provide early exposure to alcohol-specific socialization. Additional research is needed to link alcohol-specific socialization during childhood with adolescent drinking outcomes. National Institute on Alcohol Abuse and Alcoholism, National Institutes of Health, Grant No. R01AA016300 (Christine Jackson, PI). Thomas, R. E., Baker, P. R. A., Thomas, B. C., & Lorenzetti, D. L. (2015). Family-based programmes for preventing smoking by children and adolescents. Retrieved from http://www.thecochranelibrary.com. U.S. Census Bureau. (2012). State and county quick facts. Retrieved from http://quickfacts.census.gov/qfd/states/37000.html.